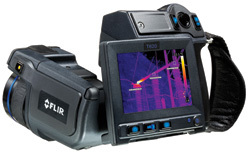 The FLIR T640bx is supplied with 25° Lens, SD Memory Card, 2 x Li-Ion Rechargeable Batteries & AC Adaptor, 2 Bay Battery Charger, Flir Tools Software, USB Mini-B Cable, Video Cable, Stylus Pen, Bluetooth Headset, Lens Cap, Calibration Certificate & Hard Carry Case. FLIR leads the way in forward thinking Wi-Fi connectivity to mobile devices like iPad, iPhone and iPod Touch. Just download the new FLIR Viewer app from the apple store and you're ready to import images from the camera.